LawrieCo deliver successful biological farming programs to farmers in South Australia and Victoria, by offering specialist advice, inputs, on farm consultation and educational opportunities. 18/07/08 - Omnia Specialities Australia offers agricultural humate products that help in stimulating the fungi and bacterial growth in the soil. 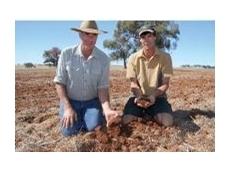 03/07/08 - Agrow Australia supplies fertilisers for the agricultural industry. In addition, Agrow Australia is involved in services for the logistics and engineering sectors. 02/07/08 - Agrow Australia offers bulk and specialty fertilisers to the Australian agricultural industry. This company is also involved in logistics and engineering. 01/07/08 - Agrow Australia has been marketing fertilisers for more than forty years in the Australian agricultural industry. 18/06/08 - BioAg markets a range of biologically active solid nutrients and fermented liquid cultures designed to produce living, healthy soils as the basis for optimum plant and livestock production. 17/08/06 - The adoption of a biological soil nutrient program six years ago has dramatically improved the productivity and general well-being of a mixed farming enterprise operated by the Watts family in Central West NSW.